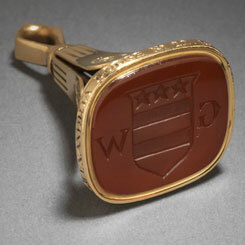 About this object A year after President George Washington helped lay the Capitol cornerstone in September 1793, he received a seal (pictured above) to commemorate the event. On this date, George Washington delivered his first regular Annual Message to a Joint Session of Congress. Article II, Section 3, Clause 1 of the U.S. Constitution states that the President “shall from time to time give to the Congress Information on the State of the Union, and recommend to their Consideration such measures as he shall judge necessary and expedient.” Washington opted to make his address in person during the opening days of the second session of the 1st Congress (1789–1791). Arriving by horse-drawn carriage on a cold January morning, the President spoke in the Senate Chamber of Federal Hall in New York City. Washington commended the work of the 1st Congress. He also made legislative recommendations regarding the administration of the new country such as the “proper establishment of the troops,” the creation of post roads, and the establishment of uniform currency, weights, and measures. “The welfare of our country is the great object to which our cares and efforts ought to be directed,” the President observed. “And I shall derive great satisfaction from a cooperation with you, in the pleasing though arduous task of ensuring to our fellow citizens the blessings which they have a right to expect.” Washington’s address set a precedent, used by subsequent Presidents, to provide an outline of goals and an annual update on the welfare of the nation to the House and Senate. Believing the practice of appearing in person to be too like the British monarch's address to Parliament, President Thomas Jefferson began sending written annual messages in 1801. President Woodrow Wilson revived the practice of presenting the message to Congress in person in 1913. The Annual Message to Congress became known as the State of the Union Address by the 1940s.